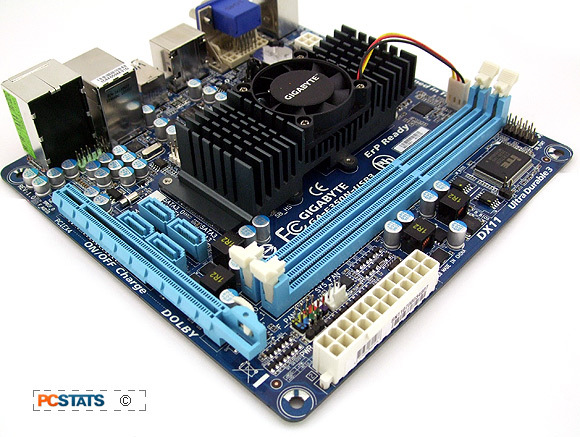 The only expansion option on the diminutive Gigabyte GA-E350N-USB3 motherboard is a PCI Express 2.0 x16 slot that operates at x4 mode. Where videocards are concerned, the AMD E-350 APU is a little underpowered so locking in a fast graphics card isn't going to return the same benefits you'd expect with a standard desktop PC. Any entry level or mainstream PCI Express x16 videocard will give good results if you find the integrated Radeon HD6130 IGP excessively slow. It's worthwhile to remember that the AMD E-350 CPU is on par with what you would find in a Netbook. 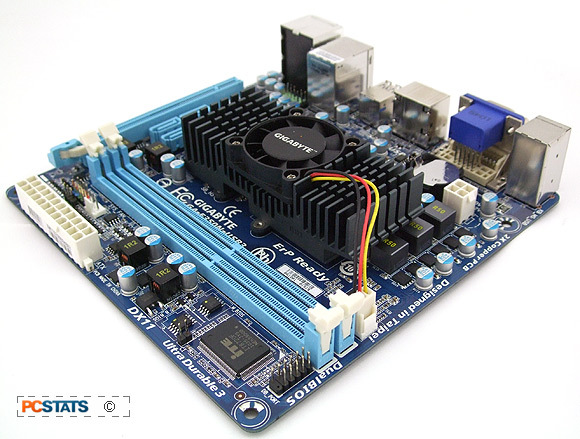 Given the small 17x17cm footprint of this miniITX board, fit around the PCI Express slot is quite tight. 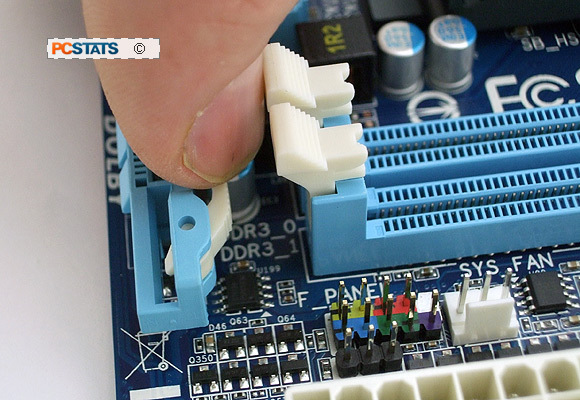 To swap videocards you must remove memory modules first, the PCI Express slot lock is hidden by the DIMM lock. Four native 6Gb/s SATA III ports are supplied via the AMD A50M chipset. Packed around the AMD A50M southbridge are a few headers for front panel audio, (2) USB 2.0 headers and the font panel I/O connections. 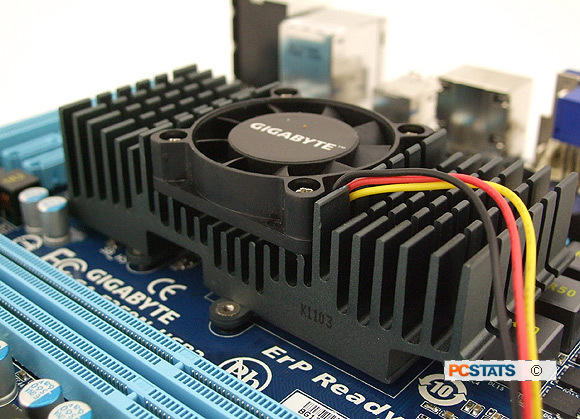 The Gigabyte GA-E350N-USB3 has two fan headers. This is the front panel audio header. 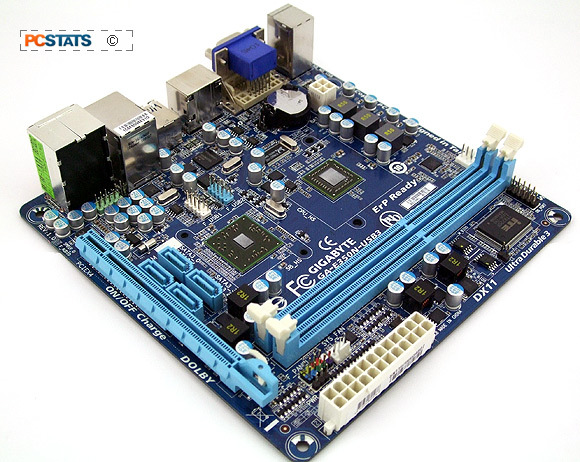 The Gigabyte GA-E350N-USB3 motherboard supports 7.1-channel audio and S/PDIF outputs along with Dolby Home Theatre. Audio is supplied by a Realtec ALC892 codec. 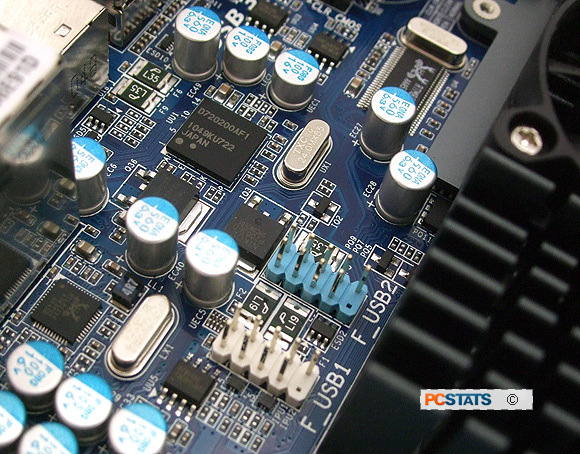 The two USB 3.0 jacks at the back panel are handled by a Renesas D720200 controller. USB 3.0 expands the bandwidth to 4.8Gb/s (4800Mb/s) which is more appropriate for today's large mass storage devices. There are four USB 2.0 jacks at the rear I/O and four more available by headers (no USB brackets are provided). 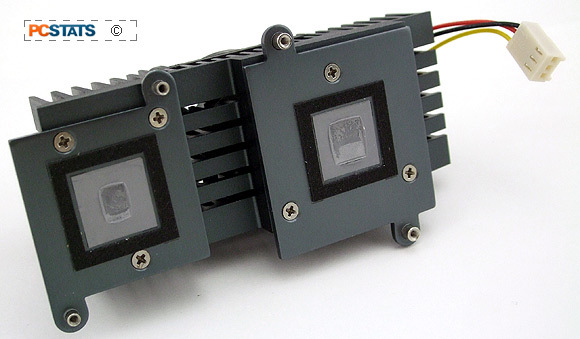 The AMD A50M chipset is cooled by a small actively cooled extruded aluminum heatsink. This (mobile) chipset communicates with the AMD E-350 Fusion APU over a Unified Media Interface (UMI) interface at 2.5GHz. Gigabyte's GA-E350N-USB3 motherboard has two 1.5v DIMMs which supports up to 8GB of DDR3-1066/1333(OC) memory in a single channel configuration. 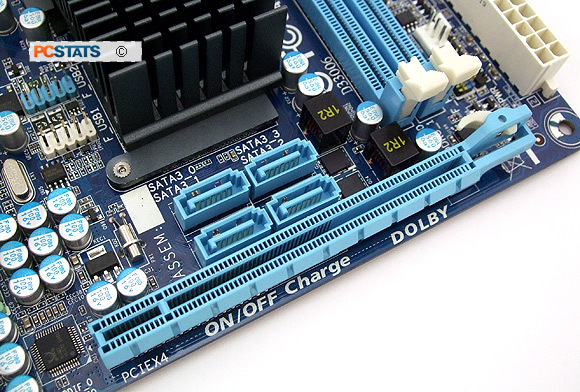 The DX11 AMD Radeon HD6310 IGP can allocate up to 1024MB of system memory to itself. Video outputs include analog VGA, DVI-D (at 1920x1200) and HDMI (at 1920x1200). A simple heatsink cools both the AMD E-350 Fusion APU and AMD A50M 'Hudson-M1' chipset. It is cooled by a small 50mm fan that is very quiet. With the heatsink removed we can see the placement of the two small ICs on the Gigabyte GA-E350N-USB3 miniITX motherboard. 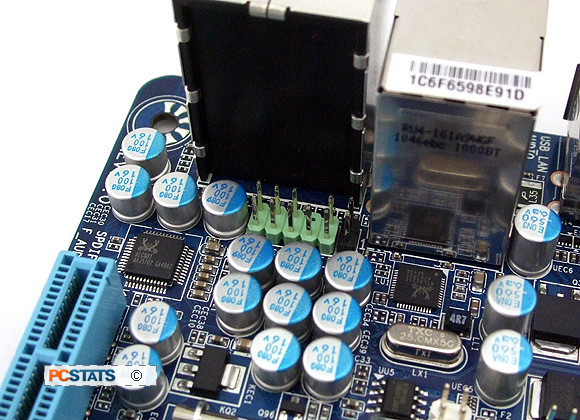 Note that only solid state aluminum capacitors are used to manufacturer this board. 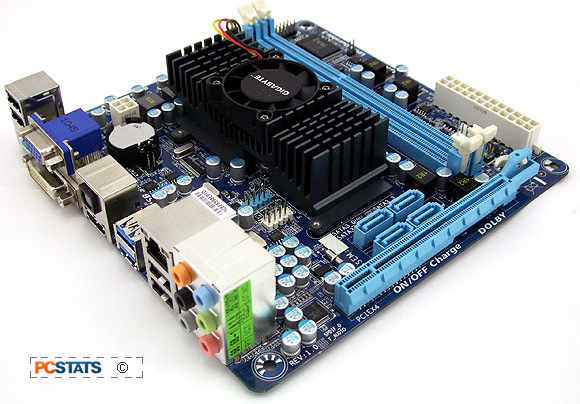 This Gigabyte motherboard uses Ultra Durable 3 components. The APU and Southbridge chipset put out little more than ~30W in total so a large heatsink isn't required. The dual-core AMD E-350 APU operates at 1.6GHz and contains the Radeon HD6310 integrated graphics processor which is clocked at 492MHz. Next up, a look at the BIOS options an then it's onto the motherboard and IGP benchmarks!